I figured I don’t have Shanghainese cuisine enough. Chinese restaurants have never been big on my to eat list for daily dine-in’s. I’ve always enjoyed my big American eats, Australian café brunches and proud Malaysian nibbles. So, when I was first told about one of the newest Chinese restaurant to hit Sunway Pyramid, I went, “Oh, what is it call?”.”Xia Mian Guan”, my friend replied. I raised my brows and went, “What?”. The food street of Oasis boulevard continues to grow ever more delicious. 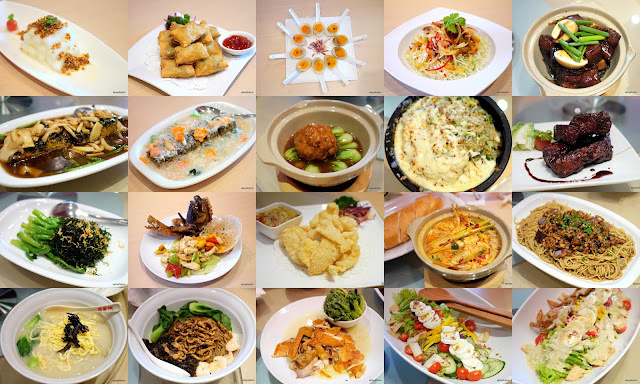 Opened about 5 months ago, Xia Mian Guan which typically means Shanghai noodle house, is the first in Malaysia serving authentic Shanghainese and Guangdong cuisine. Location wise – the place is probably not the most strategic. It’s not accessible from inside the mall but a short stroll along the row of restaurants outside, next to the main entrance and just few steps away from Brozeit and Wong Kok. Interior wise – I am pleased to be impressed. The décor provided a cosy, elegant setting with sleek and modern designs featuring oriental print wallpapers with finishing touches of ancient China. Like all Chinese restaurants, the menu is extensive and could probably be customized as well. For the indecisive gluttons, there’s always a fix menu, showcasing a standard 6 to 8 course dining experience. I was clad in red (okay, half in red) to complement the Chinese theme. Pumped up and on ever ready mode to eat, even before leaving the home. Let us start with the appetizers shall we? Caesars Salad with Soft Shell Crab. Rm48. 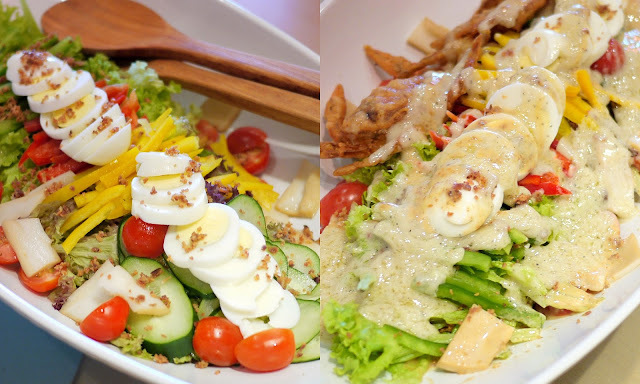 The Caesars salad came with 2 servings of delicious soft shell crab and 2 types of dressings – black pepper mayo and sesame. A pretty unconventional dish for a Chinese meal isn’t it? I chomped my way through the interesting textures of greens, that has light subtle flavours and was a perfect dish to start of a hefty meal. There were mixed feedback on this dish – some thought it was a little dry but others felt that it was just right. I thought – and agreed, that it was on the verge of being a little dry and the condiments that came with it, did not do the dish any justice at all. Crispy Bean Curt Skin. Rm12 (8 pieces). Glorious cushions of golden brown bean curd stuffed with 3 juicy variations of mushrooms – made crispy and savoury. I found this dish an absolute delish, simple yet appetizing. Winter Melon with Chilli Flakes. Rm8. Not typically Chinese, I found this combination really interesting. The sweetness of winter melon neutralizes the richness of chilli flakes – it was sweet and spicy at the same time and it’s texture adds crunch to the overall dish. I kinda enjoyed this. Homemade Smoked Duck Egg. Rm5 (2 pieces). I love duck eggs – I mean, who doesn’t? Especially liquid yolks and beautifully plated ones – lovely. Let’s move on to Xia Mian Guan’s Signature, Chef recommended dishes. Spare Ribs with Red Wine Sauce. Rm16 (per rib). Picture shows 2 ribs. Raise your hands if you don’t love pork ribs! I will be happy to gobble it all up for you! Apologies as the picture angle does not do the ribs any justice. Xia Mian Guan’s version was a mouth watering temptation – glistening ribs made tender with rich red wine sauce. I felt that it could have been more flavorful though, with a little more oomph. Marinated overnight and braised for a good 20 minutes only when ordered – these fatty chunks of pork cubes are ridiculously sinful, there were more fat than lean meat! Watch out for that liver! Braised Imperial Bean curd with Shemeiji Mushroom. Rm20 (4 pieces). The delicacy of this dish was evident in its intricate preparation of its homemade tofu using fine soya milk and topped with a layer of Chinese cabbage, then braised. One mouthful and I was sold – the tofu was fluffy and smooth; the sizzling and savoury gravy together with chewy shemeiji mushrooms complemented the dish well also. Braised Imperial Bean curd with Crabmeat. Rm20 (4 pieces). The crab meat version was a great alternative for those wanting something less rich. The sauce was filled with shreds of crab meat and I was tempted to lift the entire plate up and drink it like soup! I did watch my table manners nonetheless. Meatball (shi zhi tou). Rm20. This is one strange, scrunched-up creature but I tell you – it’s delicious. Minced pork belly with chunky bits of salted fish inside, made to standalone. Fried Rice with Cheese and Roasted Pork. Rm20. For those who love Cheese-si-Fan (Cheese baked rice), this is for you. Nothing spectacular though. “Yin Yang” Kailan with Chicken Floss. Rm20. Vivid greens of leave and stalk. My favourite element of the dish was the seaweed – it was a little too salty but I enjoyed my weeds – seaweed. Firstly, the dish can be ordered separately. Star garoupa with either the XO sauce (top) or pomelo sauce (bottom).